Active locomotion by invading tumor cells is thought to be a prerequisite step in the establishment of secondary neoplasms. 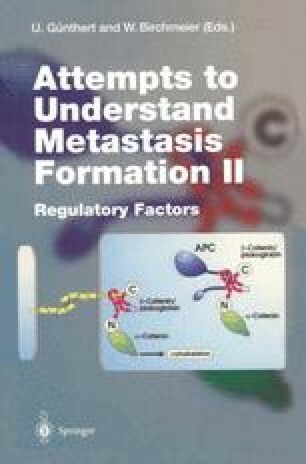 Successful metastasis requires the invasion of surrounding normal tissue and crossing of vascular and/or lymphatic boundaries (Nicolson 1988; Fidler 1990) and it has been suggested that motility of individual cells or groups of cells at the leading edge of a tumor protrusion might be responsible for such invasive movement (Strauli and Weiss 1977). Analysis of previously characterized high- and low-metastatic variant melanoma subpopulations has demonstrated that low-metastatic cells are largely immobile, while their high-metastatic counterparts exhibit profoundly greater locomotory activity (Raz and Geiger 1982; Volk et al. 1984; Geiger et al. 1985; Zvibel and Raz 1985; Raz and Ben-Ze’ev 1987). Similar findings were obtained using the Lewis lung carcinoma (Young et al. 1985) and a rat mammary adenocarcinoma model (Badenoch-Jones and Ramshaw 1984), while more recent work in the Dunning R-3327 rat prostatic adenocarcinoma model has further corroborated the relationship between motility and metastatic potential (Mohler et al. 1987, 1988; Partin et al. 1989).